MainAll NewsMiddle EastBennett: How dare anyone call the land of Israel occupied? Bennett: How dare anyone call the land of Israel occupied? Education Minister clarifies on CNN: Jews have lived in Judea and Samaria for thousands of years, and they aren't going anywhere. 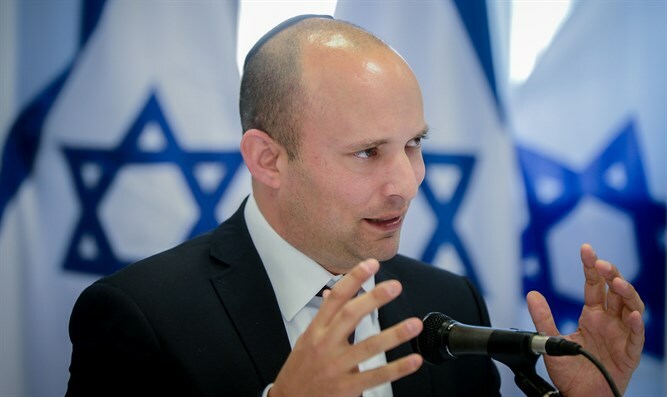 The Obama administration abandoned Israel, “the only free democracy in the Middle East,” Jewish Home chairman and Education Minister Naftali Bennett tells CNN. Speaking with Jake Tapper after Secretary of State John Kerry’s speech earlier this week, in which he criticized Israeli communities in Judea and Samaria as presenting an obstacle to peace, Bennett pointed out that Israel withdrew from Gaza in 2005 and gave the area to Palestinian Authority (PA) chairman Mahmoud Abbas. The result was a “terror state” in Gaza, as Hamas took over the region and has fired thousands of rockets at Israeli territory. “There is already a Palestinian state formed in 2005 in Gaza and they turned it into a terror state. Anyone in their right mind cannot imagine forming another one right here in Jerusalem, our eternal capital. That would be insane,” he stated. “Judea and Samaria has been a Jewish state for roughly 3,000 years, well before the first Americans reached the new continent of America, and we’re going to stay here forever,” declared Bennett. “We’re not occupying any land. One cannot occupy his own home. These are not settlements. We’ve got about 650,000 Israelis living in eastern Jerusalem and Judea and Samaria. Big cities. We’ve been here for thousands of years. We’re staying here. We’re going to live side by side in peace with the Arabs here, but not by forcing our hand,” he said.